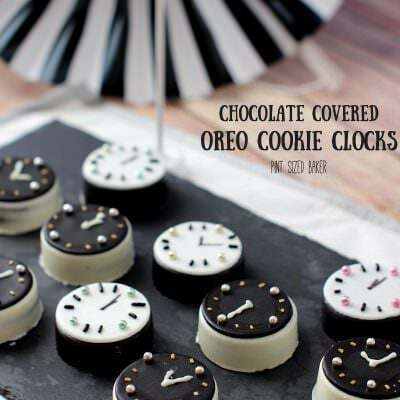 Making these great Chocolate Covered Oreo Cookie Clocks are perfect for New Years Eve or an Alice In Wonderland Party! Everyone loves them! Last New Year’s I celebrated with no-bake treats, so I figure I’d keep it up and make it a tradition. I know that most people want a fancy New Years dishes and have friends and family nearby. One great way to celebrate with kids is to have a a countdown clock. 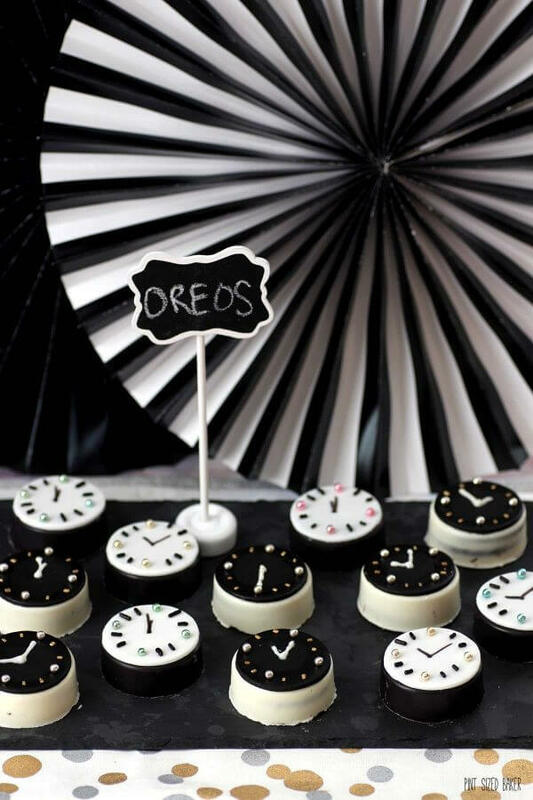 These fun Oreo Cookie Clocks can be used to countdown to midnight and they really dress up a dessert table. This no-bake treat is the perfect way to make dessert and have the kids help. To celebrate this year, I’ve got these fun Oreo Cookie Clocks, Champagne and Strawberry Jello shots and Chocolate Dipped Fortune Cookies. They are all dressed up fancy for your party! To make these perfectly covered Oreos you need the right mold. I highly recommend you use this SpinningLeaf Sandwich Cookie Mold . It’s the best one I’ve used so far. You’ll also need some black candy melts (look for it at the craft store) and some small packages of black and white fondant. I’ve only found them by Wilton in Wal-Mart. Depending on how many cookies you make, you don’t need much of it. Then you need some fancy sprinkles. I love these Silver Dragees . They are a bit pricey, but they are so shiny! I just used black jimmies and gold sugar to add the rest of the clock features. Then I used black edible markers and white chocolate to add the clock hands. Didn’t they turn out marvelous? I loved them! They would also be perfect for a Grate Gatsby themed party. 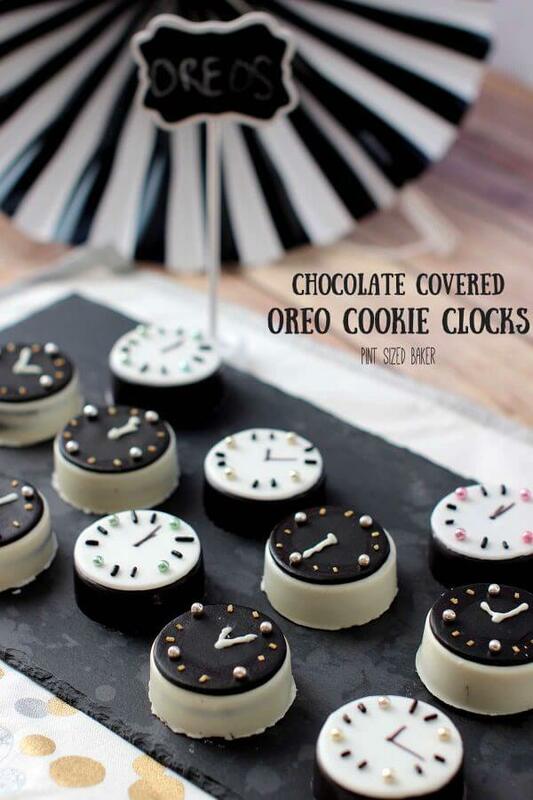 If you enjoy the clocks, you may also enjoy the Rose Oreo Cookies I made last year. 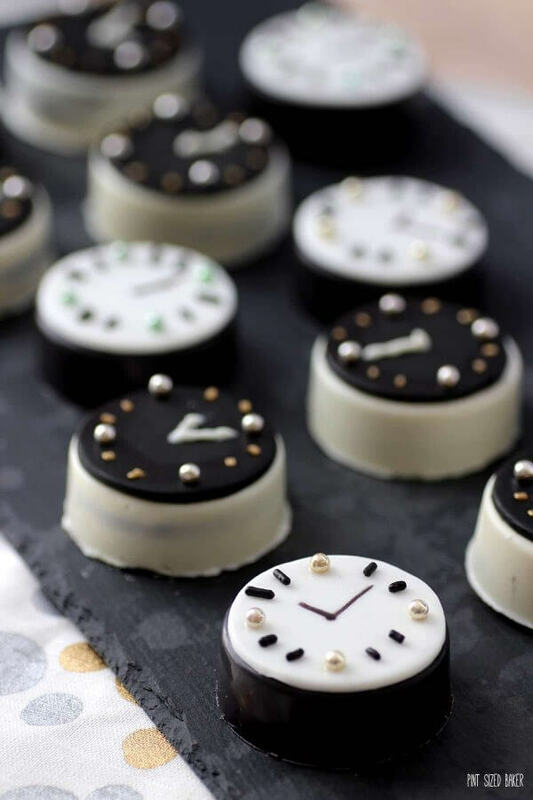 Black and White Candy Covered Oreo Cookies dressed up as clocks to count down to Midnight! Melt your Black candy melts in a microwave safe bowl. Be sure that your cookie mold is clean and dry before adding any candy to it. Stir your melted candy until there are no more lumps. Fill each cavity just over ½ fill then push a singe Oreo cookie down into it. Get all 6 cavities filled and then bang the tray on the counter to seat the candy and get out any air bubbles. Carefully add more candy over the top to completely cover and coat the cookie. Band the tray again to release any air. Place the tray into the freezer for 5 minutes to harden. Remove from the freezer, flip over and carefully press in a circular motion around the back of the cookie mold to release the cookies from the tray. If that doesn't release them, you can gently bang it on the counter. Clean and dry the mold of any black candy and repeat the process with the white candy. Using about a golfball sized amount of fondant, roll it out on a silicone mat coated in shortening. Cut out 2⅞" circles (I used these cutters) and place them over the top of the cookie. Add a ring of vanilla extract or corn syrup to the edge of the fondant to make it a little sticky to attach the sprinkles. Place the sprinkles and press down gently to secure them in place. Use a black edible marker to draw on the hands on the white fondant and white candy melts on the back fondant. Let them sit to dry completely before serving. This recipe is part one of a three part series including Strawberry Champagne Jello and Chocolate Dipped Fortune Cookies. Thanks Julianne! They are fun to make! This is such a cute idea! 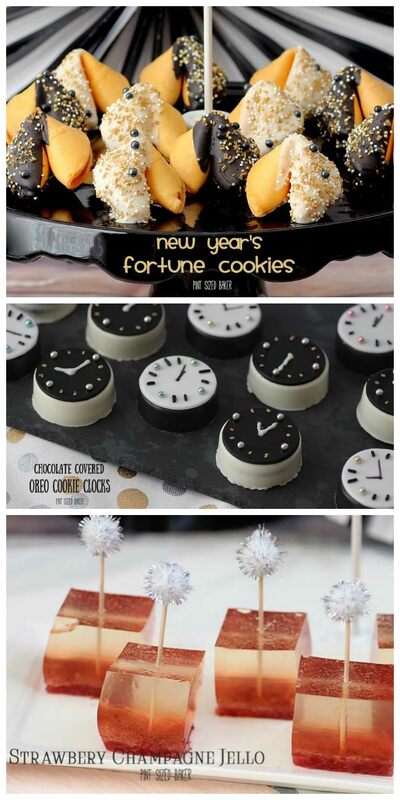 They would be so much fun to make for New Years Eve! I could eat Oreo every day! This recipe makes great party treats, which everybody loves! Me too… This dessert blogging is a slippery slope.